My sister in gave me an interesting image of an old movie theater we knew. The image had been constructed with facets. I asked John if he could make a painting similar to this. He said yes but he wanted to give the idea a more exciting structure using a variety of other images. Moving toward this commission we reviewed digital sketches that showed me what the painting would look like. I gave him the go ahead, and he went to work. I even got to see the painting in his studio a couple of times before it was complete. It was a pleasure to be included. He also posted the progressive images on the web as he got closer to completion. Palace now hangs in my dining room and invokes fond memories for me of going to movies with my sister. 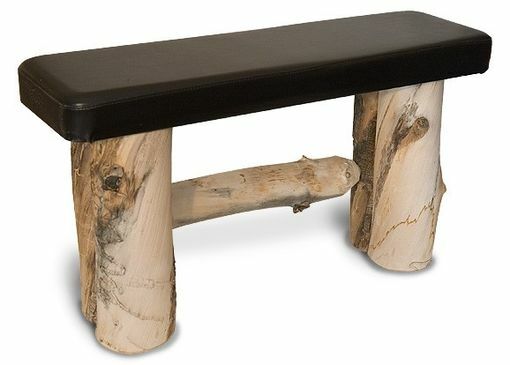 The bench is made of recycled materials. The seat is repurposed from a workout bench. The legs are made from standing dead aspen. Each one is about 4" wide; they have been planed and joined together on their shared inside surface. The surface of the aspen is polished by wind and snow at an elevation of 10,000 feet above sea level; the resulting surface is what you see here, a natural bone color, streaked with pale oranges, yellows and grays. This table has unvarnished legs, but I usually varnish them and buff them with soft abrasives to create a matte finish. Costs vary depending on how the seat is made or found. I can work with your repurposables. Each week, expert artisans from across the country become makers on CustomMade. Every maker has a story. Be a part of John Boak Art's story by placing an order, leaving a review, and seeing your review appear here.